Graceland is the name of the 13.8 acre estate and large white-columned mansion that once belonged to Elvis Presley, located at 3734 Elvis Presley Boulevard in Memphis, Tennessee, USA. It is located south of Downtown Memphis, less than four miles north of the Mississippi border. It currently serves as a museum. It was opened to the public in 1982, was listed in the National Register of Historic Places on November 7, 1991 and declared a National Historic Landmark on March 27, 2006. Elvis Presley, who died at the estate on August 16, 1977, his parents Gladys and Vernon Presley, and his grandmother, are buried there in what is called the Meditation Gardens. Graceland was originally owned by S. E. Toof, publisher of the Memphis newspaper, the Memphis Daily Appeal. The grounds were named after Toof’s daughter, Grace, who would come to inherit the farm. Soon after, the portion of the land designated as Graceland today was given to a niece, Ruth Moore, who, in 1939 together with her husband Dr. Thomas Moore, had the present American “colonial” style mansion built. Pictured right: This beautifully detailed brass ornament shows a 360 degree view of the Graceland mansion. Elvis purchased Graceland in early 1957 for approximately $100,000 after vacating an East Memphis house located at 1034 Audubon Drive. He moved because of privacy and security concerns, and the opposition of neighbors to the enthusiastic behavior of the many fans who slowly cruised by his home. Elvis moved into Graceland together with his father Vernon Presley and his mother Gladys. After Gladys died in 1958, and Vernon married Dee Stanley in 1960, the couple lived there for a time. Wife-to-be Priscilla Beaulieu also lived at Graceland for five years before she and Elvis married.After their marriage in Las Vegas on May 1, 1967, Priscilla lived in Graceland five more years until she separated from Elvis in late 1972. 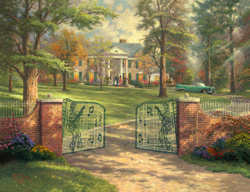 Pictured left: Thomas Kinkade painting of Graceland marking the 50th Anniversary of the purchase by Elvis Presley. After initially being buried at Forrest Hill Cemetery, and fo llowing an attempt to rob his grave, Presley’s remains were moved to Graceland. The estate has become a pilgrimage for Elvis fans across the world. The mansion is constructed of tan limestone and consists of twenty-three rooms, including eight bedrooms and bathrooms. The entrance way contains several Corinthian columns and two large lions perched on both sides of the portico. 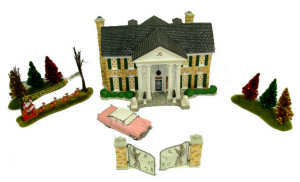 After purchasing the property Presley carried out extensive modifications to suit his needs and tastes, including: a fieldstone wall surrounding the grounds, a wrought-iron music styled gate, a swimming pool, a racquetball court, and the famous “jungle room” which features an indoor waterfall, among other modifications. One of Presleys better known modifications was the addition of the Meditation Gardens, where he, his parents Gladys and Vernon, and grandmother are buried. The garden was opened to the public in 1978. Graceland grew from 10,266 square feet when originally bought by Presley to 17,552 square feet today. Managers of the complex announced a major renovation project that will include a new visitors center, a 500-room convention hotel and high-tech museum displays. The current visitors center, souvenir shops, the 128-room Heartbreak Hotel, and museums will be torn down and replaced with the new facilities. The project will take approximately 3 years to complete. Pictured left: Plate featuring Elvis at the Gates of Graceland. Graceland was Lisa Marie Presley’s first official home, and residence after her birth on February the 1st 1968 and her childhood home, although her main state of residence was California where she lived with her mother after she divorced Elvis when Lisa was in elementary school. Every year at Christmas time Lisa Marie Presley, and all her family go to Graceland to celebrate Christmas together. Lisa Marie Presley often goes back to Graceland for visits. When she turned 30, Lisa Marie inherited the estate and she sold 85 percent of it. The Meditation Gardens, designed and built by architect and designer Bernard Grenadier, has been noted as a preferred place of Elvis in the property, where he often went to reflect on any problems or situations that arose during his life. Pictured right: Dept 56 Graceland. The book Elvis by the Presleys reveals several details concerning the singer’s life at Graceland including his obsessions and passions when staying at home. After Elvis Presley’s death in 1977, Priscilla Presley served as executor of his estate. Graceland itself cost $500,000 a year in upkeep, and expenses had dwindled Elvis’s and Priscilla’s daughter Lisa Marie’s inheritance to $5 million. Priscilla examined other famous house/museums, and hired a CEO to turn Graceland into a moneymaker. She became the chairwoman and president of Elvis Presley Enterprises. After Graceland opened to the public in 1982, the enterprise’s fortunes soared and eventually the trust grew to be worth over $100 million. 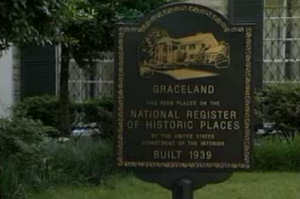 Graceland is now statistically the second most visited private residence in the United States, behind the White House. Pictured left: Christmas at Graceland, third in a series from Carlton Heirlooms, 2007. An annual procession through the estate and past Elvis’s grave is held on the anniversary of his death. The largest gathering assembled on the twenty-fifth anniversary in 2002. One estimate was of 40,000 people in attendance, despite the heavy rain. 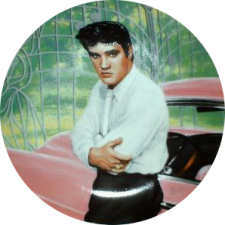 The biggest crowd in Memphis for an Elvis Week is generally regarded as the 20th Anniversary in 1997. At this time several hundred media groups from around the world were present and the event gained its greatest media publicity as an estimated 50,000 fans visited the city. The Graceland grounds include a museum containing many Elvis artifacts, like some of his famous Vegas jumpsuits, awards, gold records, the Lisa Marie jetliner, and Elvis’s extensive auto collection. Recently Sirius Satellite Radio installed an all-Elvis Presley channel on the grounds. The service’s subscribers all over North America can hear Presley’s music from Graceland around the clock. Two new attractions have been added, Elvis Presley After Dark and Elvis 56; these can be found on the plaza. Pictured right: Graceland tour leaflet. 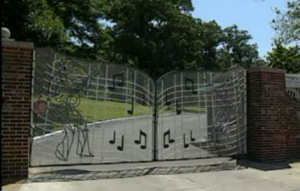 Tours of the museums at Graceland are available, though no flash photography or video cameras are allowed inside. The tour of the Graceland mansion is an audio tour, and the upper floor is not open to visitors, partially to avoid any improper focus on the bathroom which was the site of his death. The upper floor, which also contains Elvis’s bedroom, has been untouched since the day Elvis died. The tour enters through the front door, the living room with adjoining music room are first to be presented. These rooms are then followed with a walk past the grand stair case to Elvis’ parents room. Next the tour takes you into the dining room and the kitchen. The tour continues through the basement, where Elvis’s media room with its three televisions can be viewed. A bar and billiards room can also be found. The tour continues back upstairs, through the famous Jungle Room. After the Jungle room, you are taken to a small room that has displays of some of Elvis’ personal belongings. These items are all carefully selected from Elvis’ private sanctuary upstairs, which again is not part of the tour. Item s include jewelry to Elvis’ personal desk, some random items of clothing and a scale model of the home he grew up in in Mississippi. Then outside you are rounded through Elvis’ shooting range. Then into his “Trophy Room”. Originally this space was just a sidewalk behind the house that Elvis had enclosed to store his many items of appreciation. At the doorway is Elvis’ famous gold lame suit from his early years. You then proceed down a hallway lined with gold records. The tour then winds you through a display of his 68 Comeback, featuring his leather suit and some gowns worn by Priscilla. You are then taken back outside to view his still fully functioning stable of horses. Then into Elvis racket ball court. The court now houses a display of Elvis’ trademark sequined “jumpsuits”. All are presented face forward except for the last suit in the room. The last jumpsuit worn by Elvis is turned backwards as if walking away from you. Also in this room are all the awards and distinctions posthumously presented to Elvis’. Then you are taken into the Meditation Garden. Buried here are Elvis, mother Gladys, father Vernon and grandmother. A separate building houses a car collection and not far away his two planes Lisa Marie (a Convair 880) and Hound Dog II (a Lockheed JetStar) are on display. One of the most impressive displays is the trophy room off the main house, displaying Elvis’s huge collection of gold and platinum records and other awards, stage costumes, photographs and more.